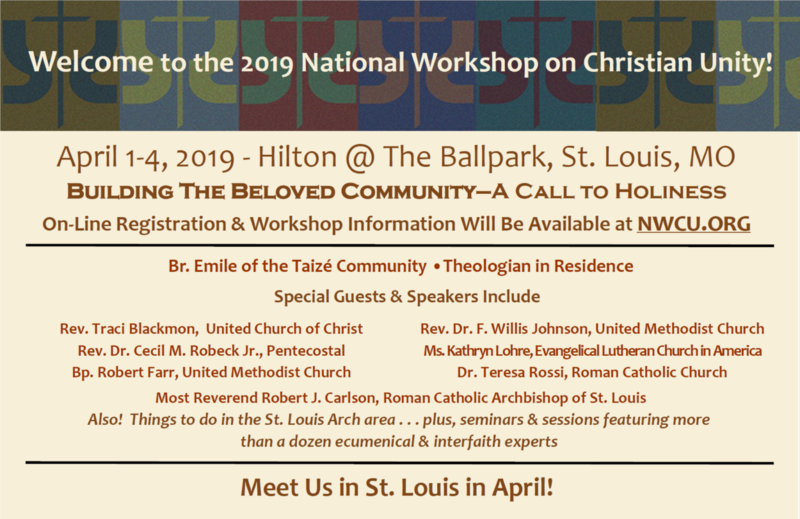 2019 National Workshop on Christian Unity Registration is Now Open! Our upcoming workshop includes a rich program of plenaries and seminars, a banquet, off-site tours, and opportunities to join together in prayer. Our theologian in residence will be Brother Emile from the Taizé Community in France. He will lead us in daily prayer, reflections and study throughout our time together. Please check back with us as we finalize our Plenary and Seminar Speakers. Hotel accommodations are being provided by the St. Louis Hilton Hotel at the Ballpark in downtown St. Louis. Reservations can be made by phone, 314-421-1776. Please mention 2019 NWCU Annual Conference to receive the group rate of $ 165.00 (does not include tax). Reservations can also be made on-line by visiting Reservations. The deadline for the group rate is 7 March. Local Transportation information will become available in the coming weeks.